Isis Pharma held a rescheduled conference call on 9/12/2011 with a guest expert Dr. John Kastelein who recently presented long-term safety and efficacy data for mipomersen (Kynamro) at the European Society of Cardiology (ESC) scientific conference in August 2011. The slides, along with my notes and analysis from Dr. Kastelein's presentation can be found below. Read to the bottom for my conclusions and question and answer session summary for those topics not related to a particular slide. More information at the company, mipomersen, and the rest of the pipeline is on the ISIS research page. Find more biotech investor, analyst, corporate, scientific, and regulatory catalysts and links to all of my webcast notes on the Upcoming Events page. You can find the link to the webcast of this event on the 3q2011 Events Archive page. Also check out the complete archive of all my blog posts about Isis Pharma and its partners. Slide 3: Many pharmaceutical companies have tried to create small molecule inhibitors of ApoB, without success. But has been long recognized as an appealing therapeutic target. 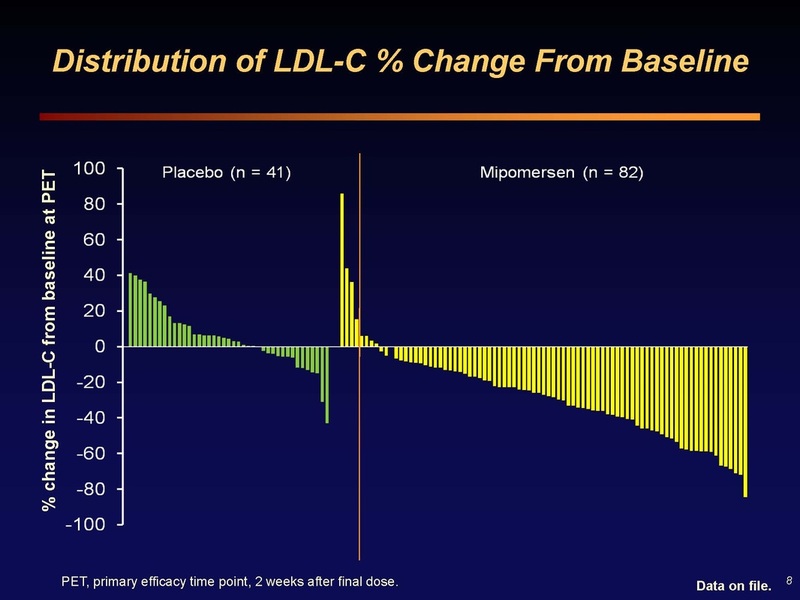 Slide 8: Waterfall plot of LDL change in each patient. There are always non-responders (or patients that don't take drug, have poor injections, etc and see increase in cholesterol). These data are from 2 weeks after final dose. Mipomersen activity surpasses that of most other agents used in this population. Q&A: what is the reason for the discontinuations? There are a wide variety of reasons...going in you always expect 15-30% dropouts per year from the literature (mostly from RA studies, where pain is a motivator)...Some social reasons (job change, move, etc), Some early dropouts in previous placebo patients who had extreme and rapid responses when switch to mipomersen- later in the study we allowed dose adjustments, but not early on. I've done many FH trials...in a one year study the normal dropout is 12% based on my 10 years experience with oral drugs (subcutaneous would always be higher). The side effects from rapid switch is not a normal sitation...In real life practice we would titrate the dose or skip a dose, because the potential benefit to these patients is so great. Therefore the trials do not mimic real life practice. When approved, will you be able to titrate the dose? The drug provided in one concetration of 200 mg/mL and that will be the recommended dose. We will have quit a bit of experience with the ability to delay a dose if we see a rapid response. We have not done intra-patient dose titration studies so ISIS could not recommend that practice. Clearly you see a wide variety of efficacy on waterfall plot (see Slide 8 above), in amount of decrease, and ALT response. 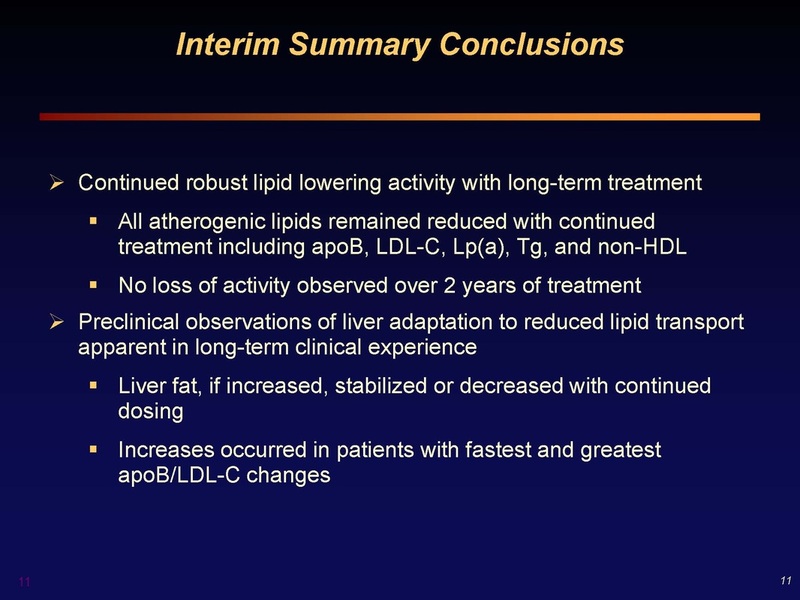 Some people have 60-80% decrease in LDL, with ALT up - their doctor would skip or delay the next dose. 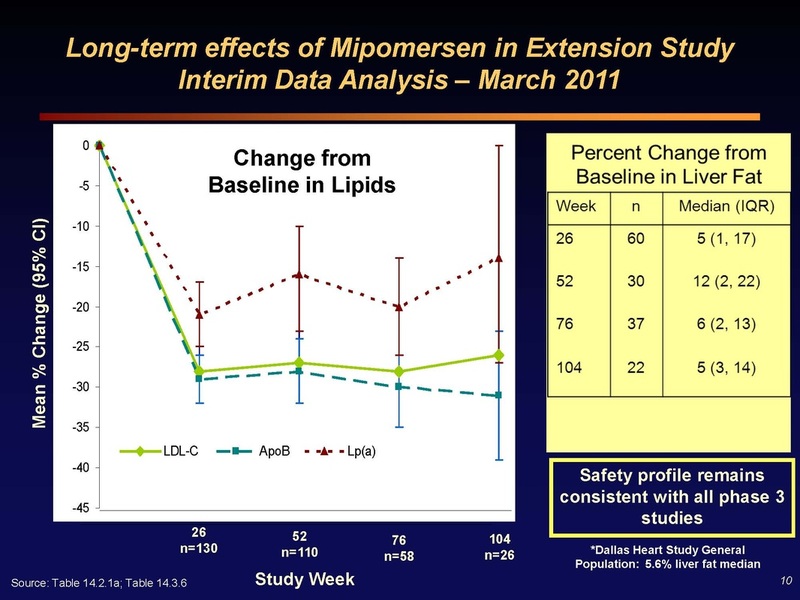 Slide 10: (Left) Two year efficacy data for LDL, ApoB, and LP(a) levels in mipomersen-treated patients. No loss of efficacy over two years of dosing! Q&A session: If you check the liver fat of the general population in Florida age 40-60, you would find more than the 5% Dallas level quoted...so it's not like these increases are dangerous. Let more people go through 2 year imaging and I think we'll be able to convince regulators. Commercialization/launch efforts underway? ISIS always defers most of this discussion to Sanofi/Genzyme. We are working with SNY/GENZ re patient and nurse education, and on the presentation of the product. What are the key regulatory issues for HoFH and HeFH populations? I don't think it will be efficacy. vs ezitimide and other 3rd line therapies. -Kynamro offers efficacy that no other drug can offer. The most important aspect of safety is the liver. And we can now say that we can dose through ALT elevations. Is liver inflammation measured in these patients? No committee will allow liver biopsy just for exploratory investigation, so the answer is no. You would need clinical rationale...and we don't have that since the liver fat goes back down. Crooke added "there were 5 patients who had liver biopsies and no inflammation was seen"
What % of patients came off due to ALT elevations? We saw no bilirubin increases, and there has never been a Hy's law case (production capacity of liver disrupted). As a comparison, 3.5% of patients taking 80 mg dose of Lipitor have ALT/AHT elevation and this has never led to any toxicity - just imagine how many patients that represents! 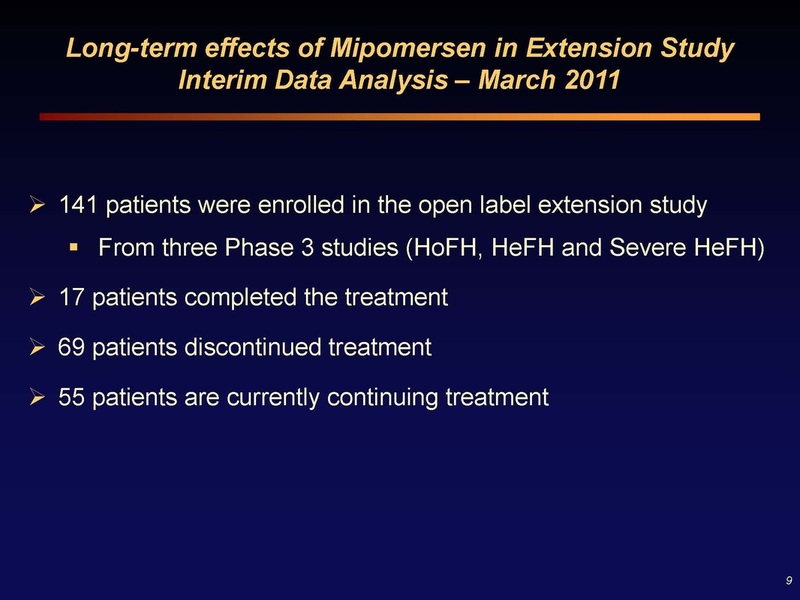 Consider the oral MTP inhibitor (from $AEGR) and mipomersen - how would you use them in clinical practice? we know that oral MTP inhibitors will lead to steatosis (liver fat deposits) in all cases (NEJM article), and not enough research has been done to know how we can control this. So these drugs right now can only used in the severest of the severest patients when you can balance liver fat against prospect of death at age 14 or something. In contrast Dr Kastelein mentioned mipomersen as a drug that he envisioned being using for 15-20 years. What is the yearly cost? This has not been set yet, will be decided by Genzyme, not final until approved. Keep in mind that a 100 mg/dL reduction in LDL corresponds to 50% decrease in cardiovascular risk - this is a high value product and will be priced as such. 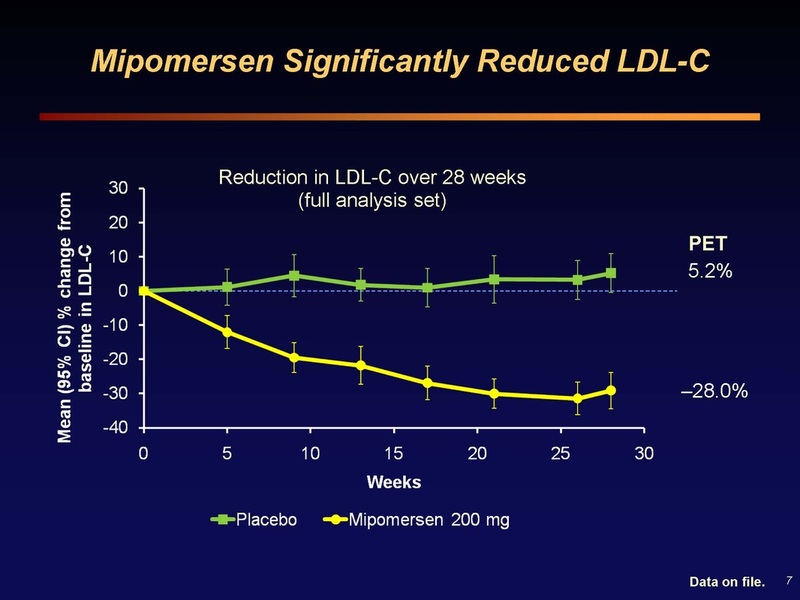 The efficacy of mipomersen in lowering LDL cholesterol and associated, independent markers of cardiovascular risk is excellent and unquestioned. In the context of the patient populations covered in the initial regulatory filings, it is clear that the liver safety concerns have been overblown. The risk/reward balance must be factored in, and these are patients who, if left untreated, have a 50% chance of dying before age 60. The initial regulatory filings in the US and EU will result in approval, likely by mid-2012 and perhaps earlier based on SNY's projection that Kynamro will be launched by March 2012. Patient uptake and penetration will likely be rapid and deep in the few thousand most severe patients. Overall adoption in the initial population (20-25,000 consisting of HoFH in US and HoFH plus severe HeFH) should be quite strong as well. The absolute minimum price of the drug will be $100,000 per year (price of lipid apheresis). At this price, gross sales of Kynamro would be $100m per year for every 1000 patients on drug. With 30-50% of net sales flowing to ISIS in royalties, this quickly becomes a significant revenue source for ISIS with which to fund their earlier stage pipeline programs. Based on the numbers, it is not hard to conceive that this drug could do over $500m in sales, without gaining expanded approval in the US for severe HeFH after completing the 12 month study. I do not believe that SNY will pursue any populations beyond that study without using a follow-on next generation ApoB antisense drug. Still, with the 40,000 US and EU population, plus additional patients in other countries, this could still be a $1b drug without doing an outcome study to gain wider patient access. In short, the sales and market potential of mipomersen was clearly overblown historically. And Genzyme may well have overpaid for the licensing rights. Neither of these points change the fact that this drug could offer a commercial validation of ISIS's second generation antisense pipeline and prodive meaningul revenues to Isis Pharmaceuticals. Do you like or dislike the new format for my notes from this conference call? Please send me a note to let me know! If you find this analysis helpful for your research or investing, please consider a small donation in support of the site.